The game to end all games. 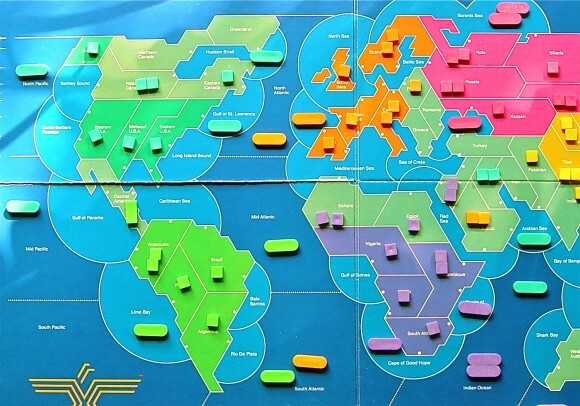 Supremacy takes you into the world of international trade and military strategy. Supremacy mirrors the global tension of the real world. It's your chance of a lifetime to find out what it's like to be the leader of a Superpower, with the opportunity to conquer the world through economic, political, and military power. With Supremacy as each player's goal, the build-up of resources begins as players open companies, buy and sell in the market and among themselves, and borrow if need be from the bank. Resources and cash are used to amass costly power -- armies, navies and nuclear weapons. The chill of the cold war is soon felt when the first nuke is built, then the other players find no comfort, until each has one too. The race is on -- even into space. Winning the game by Supremacy does not necessarily mean nuclear catastrophe. Indeed, that player is ranked a "5-star general" who triumphs over all his opponents without resorting to the use of nukes. In Supremacy there's a time to buy and a time to sell, a time to build weapons and a time to attack. Everything is done in order, but as a Superpower leader it's up to you to shape the world rather than be shaped by it. Add a Review for "Supremacy"